We have quite a bit of phlox growing in our garden here; at least five patches that I can call to mind without benefit of actually walking through the garden. All shades: white and purple and pink. They’re pretty flowers, especially in large clumps, even if they are prone to fungal rusts. They’re also very appealing to sphinx moths. Most of what we observe at the phlox are the diurnal Hummingbird Clearwings, Hemaris thysbe. These guys are regularly seen in the garden visiting the phlox, the blazing-star, the beebalm. I see them about in the afternoon and sometimes just at dusk. And then, every now and then, we spot something different visiting the patch of phlox beside the front door, right as dusk is falling. Dan called my attention to this one this evening. 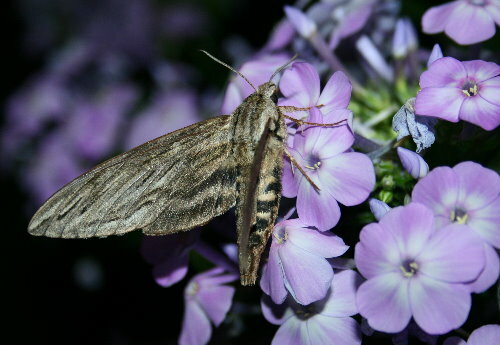 This was a new species for the phlox: a Canadian Sphinx, Sphinx canadensis. In fact, I think it may even be new for me; I have no images of the species among my photo records (I lied and told Dan I did, when he asked if I’d seen it before, thinking that I’d got it at my parents’ old house years ago, but when I went back and checked my records it turned out I’d been thinking of something else). It seems to be an uncommon to rare species but one with a fairly wide range through the northeast. The caterpillars feed on the rather disparate species White Ash and blueberry spp. We don’t have blueberry here, but there’s lots of ash about (and I guess at least some of it, therefore, must be White). You should! I’ve been surprised that I’ve noticed at least a couple of species of sphinx at my phlox that I haven’t seen come to my sheets. I just this afternoon posted a piece on Hemaris spp. (http://northoftheridge.com/2011/08/shooting-the-sphinx/), and you made it into a footnote. Congratulations, not everybody gets a footnote. We have a lot of sphinxes on the accursed Cleomes, I think about six species, I have to go back and check my records. Thanks for the mention, John! Great article and fabulous photos. I always have a lot of trouble getting good shots of these guys.